L-type GSM Antenna is designed to operate at a frequency range of 870-960MHz/ 1710-1990 MHz. The GSM Antenna ensures vertical polarization at an ampedance of 50 ohm. 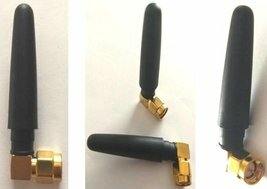 Plusar Electronics Pvt Ltd supplies L-type GSM Antenna. Pulsar Electronics Pvt Ltd offers a wide range of electronic equipments like GSM antennas, modem, blue-tooth adapter, GSM/GPRS module etc. The L-type GSM Antenna is capable of working under temperature range of -40C to +85C.